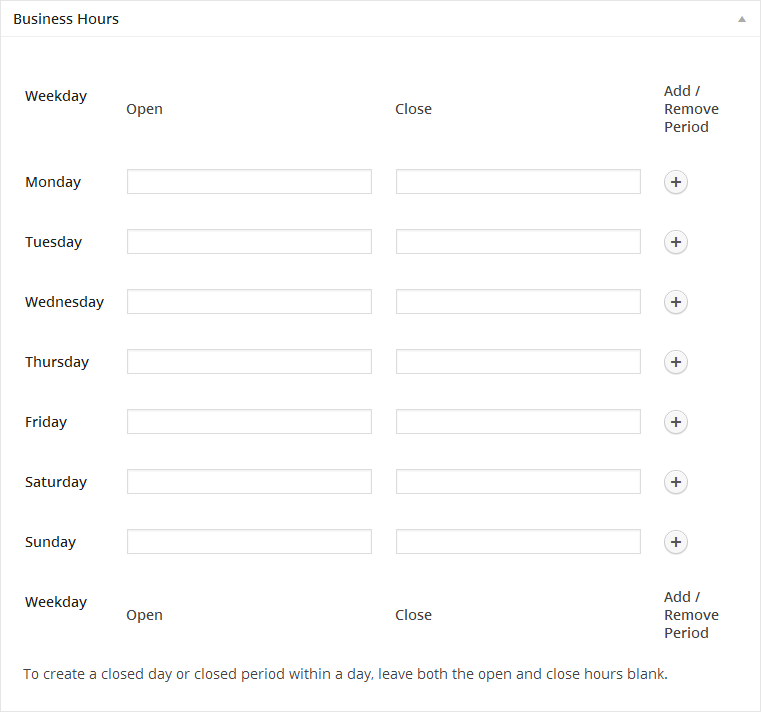 Business Hours Extension for the Connection Business Directory plugin. Open Hours adds a new dimension to Connections, time. 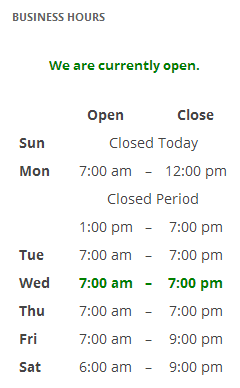 Time, as in business hours. 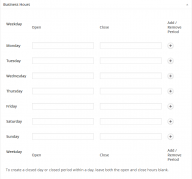 With this this extension every business in your directory can add their hours of operation. Checkout the video walk-thru and screen captures. The start of the business week uses the “Week Starts On” on the “General Settings” admin page. The time format will be displayed using the “Time Format” on the “General Settings” admin page. Adds a new highly customizable widget that can be placed in your theme’s sidebar. The widget will only display on the entry detail page making it compatible with all templates. TWEAK: Remove use of create_function() to register the widget. TWEAK: Restructure code to more closely match the addons so it is more consistent. TWEAK: Minor tweak to CSS to help make sure the time sliders are aligned with their labels. OTHER: Remove extra whitespace and comment out unused methods. OTHER: Bump minimum required PHP version to match core. DEV: phpDoc additions and corrections. TWEAK: Only save open hours data array if open hours have been added. BUG: Fix ability to clear an open/close time period input field. BUG: Corrected PHP 7.1 warning, "A non-numeric value encountered". BUG: n displaying the time on the frontend, supplied the convert from time format so it is properly displayed when converting from one format to another. TWEAK: Refactor Connections_Business_Hours::dateTimePickerOptions() to utilize cnFormatting::dateFormatPHPTojQueryUI() to handle converting the PHP datetime format to the jQueryUI datetime format. TWEAK: Refactor Connections_Business_Hours::formatTime() to utilize cnDate::createFromFormat() to handle the conversion of to/from date formats. TWEAK: Update usages of Connections_Business_Hours::formatTime() to new signature. BUG: PHP error notice fix, check for array value first. BUG: <th> tags should be within <tr> tags. I18N: Add Dutch (Netherlands) translation. 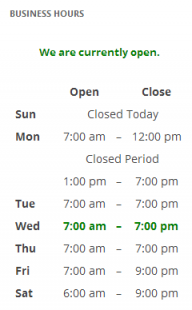 BUG: Add missing text domain to "Business Hours" so it is translatable. BUG: Correct text domain in the widget. BUG: Fix filters for language files. TWEAK: Comment out unused activation/deactivation hooks since they are not used. I18N: Add Swedish (Sweden) translation. BUG: Load plugins textdomain on plugins_loaded action hook. BUG: Make two missed strings translation ready. BUG: Empty string should not be run thru gettext. TWEAK: Add POT file for translation. TWEAK: Add Income Level link to readme.txt. TWEAK: If no open hours have been set for any day or any periods within a day, do not show the open hours content block. BUG: The front-end CSS file was not being enqueued if Form was not installed and activated. TWEAK: CSS tweak for better Form 2.0 integration. TWEAK: Refine CSS and JS enqueueing logic. Requires Connections >= 0.8.9.